That's the point. 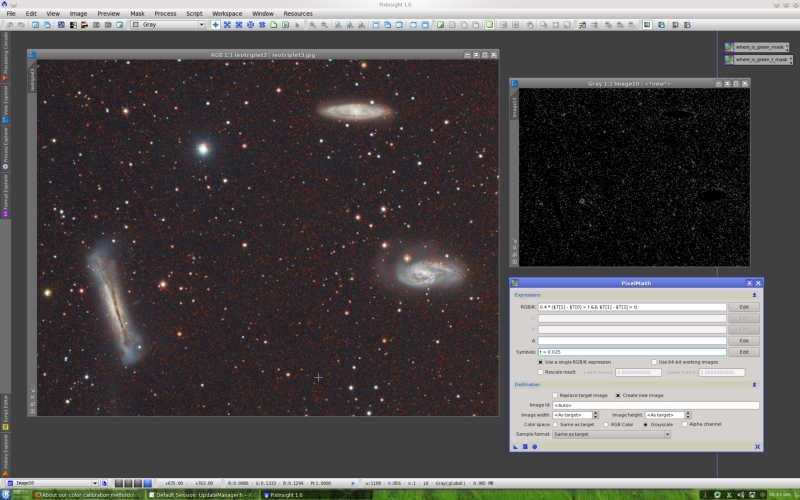 I completely assume that, by calibrating the colors with a spiral galaxy, you don't have real colors. In fact, I'm not longer interested in the (boring to me) concept of real color. But, thru the years, a key point of G2V calibration has become to represent star colors as we would see them. This is not tru, IMHO. But if our image is well color balanced, why "change" the stars that look green to something else? I'm sorry, this is really weird to me, so please bear with me. But, thru the years, a key point of G2V calibration has become to represent star colors as we would see them. This is not tru, IMHO. Isn't that what I said a few posts back? Quote: "The problem, as I see it, is not in what method is being used but in believing that using this or that method will give us a more accurate, or neutral image." I think, as far as methods and paradigms go, I'm done here. BTW Georg, I did that thing but wearing green glasses (I think they were green) during a Halloween party, for 5 minutes... After taking them off, everything was RED. The point regarding green stars is that the black body radiation, when has its maximum at the green wavelengths, has a fairly flat spectrum in the visible range (well, not that flat, but not enough to reveil a strong green cast). At least, visually you won't be enable to see a green star through a scope; you'll see it as white. Yes, this is another point. But this is emphasized by the fact that R and G filters are usually far more separated than our eye's sensitivity curves. But I'm sorry, has my last question been answered? My last question is, if our image shows green stars, why do we "change" them in our image to something else? Looking at the examples it appears the is a some blue green fringes around many of the stars. This is more prominent with the PI methoid in this image. I think this increases the green star preception. In general, I don't see green stars in my images using the PI methoid. Generally, I am using stars-structure rather than a galaxy. in my experience, star colors vary largely with filter transmission / sensor QE curves. For example, I remember that, when I worked with DSLR, I always had pink stars. Honestly, I don't know which filter set Oriol and Ivette used for this image. if our image shows green stars, why do we "change" them in our image to something else? Ideally, if we acquire RGB images with a filter set well correlated with human vision, then there should be no green stars. For example, it is very difficult (impossible?) to get any green stars with a DSLR camera. If our filters don't have good crossovers and/or their transmittance peaks don't correspond well to the sensitivity peaks of human vision for each color, then we can consider green stars as an instrumental defect —on the basis that our initial goal is reproducing red, green and blue as we perceive them under normal conditions— and try to fix them. This is how I see this problem, at least; others may have different interpretations. Looking back on the examples. The first set had very bad green or blue green fringes on the stars. Perhaps, increased FWHM of blue and or Green? This makes the stars appear much more green especially in the PI cal image. The reprocessed second set is much better. That is, the fringing is not as bad and star colors appear less green. What I am saying the fringes are biasing our preciptions to some degree. The central color may not be as green as one may think. Click to see a full size version. This expression builds a binary mask that is white only for pixels where the green component is greater than both red and blue. Then multiplies it by 0.4 to generate a translucent mask. The mask must be activated inverted. with the symbol t = 0.025. The mask generated this way is not black only for pixels where the green component is a 2.5% larger than red and blue. With this constraint, we see that only a few peripheral areas of stars are being represented with a 2.5% green dominant or greater. I can see that, but if the problem is that the filters transmittance peaks don't correspond well to the sensitivity peaks of human vision... and ...our initial goal is reproducing red, green and blue as we perceive them under normal conditions, but the principle being discussed is precisely that our vision system shouldn't be used as a reference, shouldn't those who try to avoid "the human bias" then leave the "green" stars alone? but the principle being discussed is precisely that our vision system shouldn't be used as a reference, shouldn't those who try to avoid "the human bias" then leave the "green" stars alone? We have two different items here. They may seem related but they are not. When we say that the human vision system is not suitable as a reference for color calibration of representations of the deep sky, we refer to using solar type stars as white references with the purpose of achieving "real color". We say that such thing is an illusion, for the reasons that we have explained in this thread and others. Actually, the problem is not with G2V. One could use any spectral type as white and our objections would be the same. We have described other methods, better in our opinion, that do not consider (or, to be more precise, try to avoid considering) any particular spectral type as a white reference. The other item is how we represent different wavelengths in our images. This is a completely arbitrary decision. Mapping wavelengths to the usual red-green-blue sequence is just one possibility. For example, in narrowband imaging, we often represent different emissions with arbitrary color palettes, often completely unrelated to their position on the spectrum, in terms of the human vision. The Hubble palette is a palmary example. As another example, one could perform a color calibration with Vicent's galaxy method and then remap colors by swapping red and green, or red and blue, etc. Why not, if for a given image that remapping achieves a better visual separation of structures, or any other improvement that could be desirable for documentary or communication purposes? Or just because the author thinks the image has more aesthetic value in that way. As long as coherent and well-founded criteria are used, we have no problems with that things. Why not, if for a given image that remapping achieves a better visual separation of structures, or any other improvement that could be desirable for documentary or communication purposes? Or just because the author thinks the image has more aesthetic value in that way. As long as coherent and well-founded criteria are used, we have no problems with that things. Exactly... Why not? But then, don't you depart from the unbiased philosophy of color? I believe that changing the color of stars for documentary, communications or aesthetic purposes is not unbiased, but please correct me if I'm wrong.